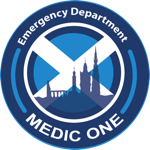 Edinburgh Emergency Medicine - TGI Resus Friday! The Medic One Simulation Team got off to a great start today with the first Resus Friday teaching session. Shirin led the way with Non-Invasive Ventilation. The session was extremely well-attended by a group that included charge nurses, staff nurses, CSWs, junior doctors and EM registrars. Topics covered were indications, contraindications, equipment set-up, mask application, initial settings and patient scenarios. It was designed to be a very practical session held in the ED Resus Room using our own NIV equipment. Many staff got involved, fitting the mask onto each other and working through the clinical scenarios together as a team. We would like to thank everyone for their support, enthusiasm and eagerness to learn, especially the night staff who stayed on after their shift had finished in order to join us. Over the coming months we will be covering 6 topics (IO insertion, mechanical CPR device, basic airways, arterial lines, traction splints and NIV). Sessions will be repeated and the library will grow to incorporate topics such as RSI drills, surgical airways, the major haemorrhage protocol, and many more. Older PostSeeking the Answer...Or Not?